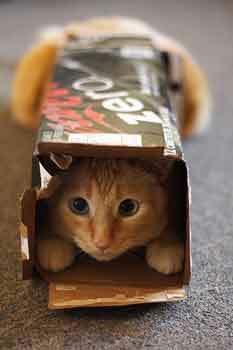 Welcome to April’s Our-happy-cat.com newsletter. I hope you all had a good Easter and didn’t eat too much chocolate. I always end up making sure that all my cat owner friends remember not to give any to their cats; it can be so easily done when there’s so much chocolate about. In this months newsletter I will be telling you all about an exciting addition to the website to honour all the good work carried out by our vet friends and will also be asking for your ideas and opinions on some other new proposed areas of the website. I do hope you will join in and help to make this cat website as enjoyable as possible. Just to let you all know Little Mo is getting over her thyroid operation well and her fur is growing back nicely, her period of looking like an alien was thankfully brief. The operation seems to have worked well and she no longer eats like a horse and her weight is now back to normal. So hopefully there are a few more years in the old girl yet. Enjoy this months Ezine and don’t forget to enter our monthly caption competition for a chance to win a great prize. The Cat Health Guide – I get asked so many questions about cat health problems and the fact that the pages regarding cat health are the most visited areas of the site, I decided that it would be a good idea to offer the sites cat health pages as a downloadable cat health guide. This would enable people to always have a copy available no matter what time of day or night it was. I always find that having books and guides so much handier than having to keep logging into websites, especially in an emergency. 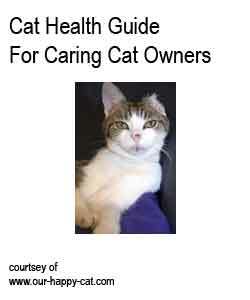 The guide only costs $2.99 and is available for instant download and can be found on the Cat Health Pages. Thank your vet pages – I have known some great and caring vets over the years and I feel that they are very much the unsung heroes. They work very long hours and have not only have great medical knowledge and skills but also have to have a fantastic bedside manner for not only the pets but also all of us anxious pet owners. So I thought it would be a great idea for cat owners to thank their vet by submitting their vets details and telling us all why they are good vets. By doing this you are informing others who may live in your area of the details of a good vet and also if possible I will notify the vets concerned that they have been thanked for their hard work. As more submissions are made I will categorise them so that they are easily searchable for other visitors to the site. Please submit Here and thank your vet. This month we are asking our readers to make some suggestions as to how they would like to see the Our-happy-cat.com website grow. If there is something you would like to see on the site then we are asking that you Contact Us and let us know. One suggestion is that we expand the your cats pictures area into a sort of mini my space for your cat. Here you would be able to add pictures and stories about your cat and your life with them and build up your own area of the website. Others can comment and contact you if they want to and so turn the site more into a community. What do you think? Please let us know by contacting us here. Here is April's Caption Competition. You are the first to see it as it doesn't get posted onto the site for a few days, so it gives you extra time to get your entries in first. The deadline for this competition is Apr 20th. The best caption will be chosen and the winners name and caption will be posted on the www.our-happy-cat.com competition page. 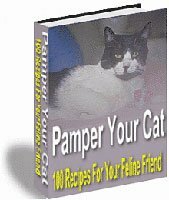 This month the prize is a copy of the ebook Pamper Your Cat - 100 Home made Recipes For Your Feline Friend and The Cat Health Guide. Today I am really happy because spring is springing in the UK at last. The evenings are getting lighter and I feel like going outside and exploring again. Once my fur has grown back completely I'm sure my mum and dad will worry where I am as I plan to go out and make my stake on my territory again and this could take me some time. I have seen a few new cats in the area latterly and I don't want them getting too big for their boots, I may be old but I can still the best cat in this street. Owning an animal used to be only considered when it was needed to carry out a purpose like ploughing fields, catching mice and rats or for hunting with. They were seen only as another possession and not something to be overly concerned about once it passed away. However all of that has now changed and owning an animal purely as a pet is far more commonplace and so to has their significance in our lives. We now consider them as part of the family, to love and care for them as we would any other member of our family. This attachment to our pets brings us many years of companionship and love but it does also mean that when they pass away, we also suffer grief and pain. However how do we express this sense of loss, when to many, an animal is just an animal and in many cultures grieving for a pet is seen as silly and as a weakness. It is just as important to find ways to come to terms with the loss of our pets, as it is when we lose any member of our family. If we don't it could lead to physical illness and depression. It is therefore important to find someone to speak to who will understand your grief and who can help and support you through these sad times. They should allow you to cry and to talk about how you feel. If there is no one in your family or circle friends that you feel will be sympathetic to your feelings, then contacting a local animal charity and asking them for help is perfectly acceptable. Some animal charities even have dedicated telephone lines to help people with their loss of a pet. Make sure you eat regular meals, it may sound silly but during the grieving period it is common for people to forget to look after themselves as they normally would and may even find that they lose their appetite. Not eating will only make you feel worse. Allow yourself to cry without feeling embarrassed about it. If someone asks why you are crying, simply say that you have lost a dear friend. Try not to dwell on the loss, keep yourself busy. Don't forget to continue to pay attention to any other pets you may have. They too will be experiencing a sense of loss even if it is not shown. When we lose a member of our family or a friend the ritual of holding a funeral to say your final farewells can be the starting place to accepting your loss. Unfortunately this rarely happens for our pets and so because that final farewell doesn't happen we may feel that we have not yet let go of them and so can prolong the feelings of grief. It can therefore be helpful to have some sort of memorial for your pet. It doesn't have to be much, a planting of a tree or bush, or placing a small statue or plaque in the garden, may be all that is needed to say goodbye and to help you through the grieving process. One of the hardest things to cope with when a pet dies is explaining it to a young child, who may have built up very strong bonds with the animal but who does not understand the concept of death. Many parents feel worried about trying to explain what has happened to the pet, as they feel that as the child's first experience of death, the explanation should be a positive one and not something that will frighten the child. The best way to explain to a child about death is to be totally honest with them. Use real words like death and dying rather than words like sleeping etc. By explaining death to them in a calm and positive way it will help them come to terms with future losses and will prevent possible future confusion if they hear the truth from someone else. Children will respond to the death of a pet in different ways, some may start to do some very strange things like burying toys for the animal to play with or drawing pictures of the dead animal underground. Whichever way they want to express their feelings should be allowed and even encouraged and crying in front of your child will allow them to also feel as if they can cry too and not to try and be brave about it. Coping with the loss of a pet is never easy and you should always allow yourself time to come to terms with it. Often rushing out to replace the animal is not the best solution and can even cause other unforeseen problems not only for yourself but also for your other pets. As a special thank you for subscribing to our E-zine we are giving you the opportunity to buy your very own “Our Happy Cat Tile Coaster” with your cat’s picture replacing Mo’s picture as seen in the image, for the special price of $4.99 +p&p (normal price $6.99). The Tile is 4.25" x 4.25" ceramic tile coaster. 1/6 inch thick. Dishwasher safe. Just Email Us your cats picture along with your delivery address and we will do the rest. We will send you a email to let you know that we have received your picture and a link for you to pay us via PAYPAL.